Our number books went home a couple of weeks ago, I just been slow to tell you about it. Sorry if you were waiting for the finished product. The last two numbers we needed to add were 9 and 10. 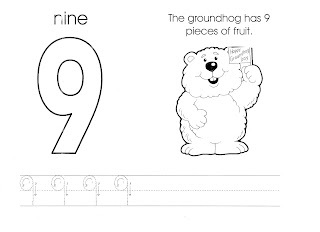 For number 9 we had a groundhog with 9 pieces of fruit. I was planning on cutting out some small fruits so the children could glue them with the groundhog, but I got lucky and found fruit stickers in our supply. So, the children just needed to add 9 fruit stickers. They then added 9 beads to their number lines....so close. 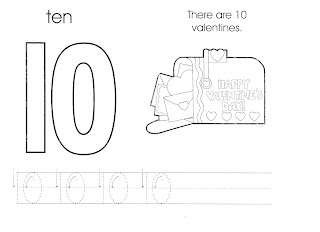 We did number 10 right before Valentine's Day so of course we had to have a Valentine paper. I had a picture of a mailbox and we added 10 valentines. To do this I again had stickers. We had lots of valentine stickers so I let the children choose the ones they liked best and they put them on the paper. And the final project---10 beads on the number line. The children were so excited to take their books and number lines home to show their parents. I had made the cover for the book on the computer, so we just had to staple them all together. I hope everyone enjoyed their books. The children did a great job! Are you interested in obtaining the number pages? Click here. I love the number line! hi! There are many beautiful events. I pre-school teacher. You can see my activities by visiting a different blog site. Now THAT is cute and gets the kids really talking about and interacting with the numbers. Good stuff! I was not able to click on 9 or 10 to obtain the pages. COuld you fix the link? I would love to use them. I'm not sure why the links for these two numbers aren't working. I've reloaded them before, but they just won't work right. I'm sorry--I'm not super techy.